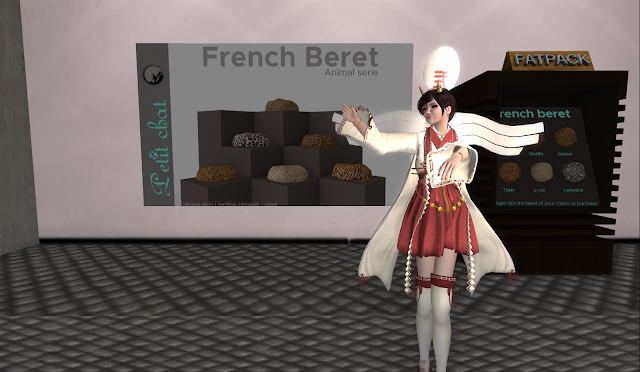 The French Beret - Animal series is a new release from Petit Chat for the Marvelous Event and it comes with synthetic animal skin looking texture (rest assured no animal is killed to make this!) featuring 6 of the most beautiful animals on you head! And each of these styles comes in 2 versions. Kitty will try out 3 of these. Can you guess the one here? Hint : It is an animal with long neck. The Jaguar texture is beautiful all by itself and you can already feel how warm it is, just by looking at it. This is perfect for the cold weather. The Tiger texture is outstanding on its own and this is not as common as leopard, so if you are a big fan of the Tiger, this is your chance.